Buffalo State’s Art Conservation Department faculty members Rebecca Ploeger, assistant professor, and Aaron Shugar, Andrew W. Mellon Professor, were interviewed in a February 23 Buffalo News article about their work analyzing materials used on the iconic Starship Enterprise, the studio spacecraft featured in the original Star Trek television series. The 11-foot-long model has been housed in the Smithsonian National Air and Space Museum since 1974 and a conservation project began last summer to restore the spaceship to its former glory. Art conservation alumnus, Malcolm Cullum, ’95, chief conservator and Engen Chair of Conservation for the National Air and Space Museum, is overseeing the project. Last summer, Ariel O’Connor, ’09, who works as a conservator at the Smithsonian, contacted Ploeger and Shugar for their help in identifying adhesives and other materials that had been employed in constructing the model. 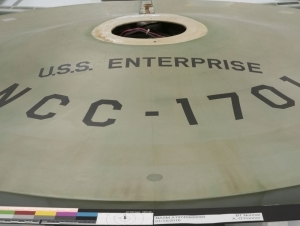 The Enterprise is expected to go back on display at the National Air and Space Museum in July in celebration of the 50th anniversary of the Star Trek pilot episode.